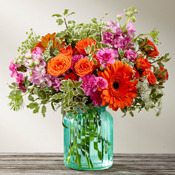 Bright, summery blooms in a beautiful keepsake glass vase. 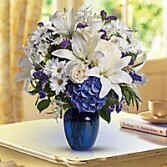 A lasting tribute for any home, made of fragrant white lilies, soft ivory roses and bright blue delphinium. 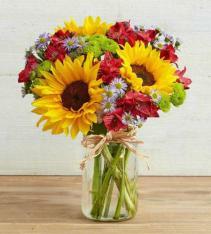 A vibrant, seasonal assortment of fresh cut flowers tied with raffia, wrapped in floral paper. An easy and beautiful "drop-in" presentation for your host and hostess. 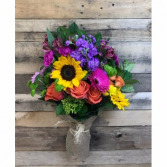 This perfectly vintage display of our freshest blooms set into a colored glass mason jar, perfect for any occasion...don't forget to finish the gift with a mylar balloon, Godiva Chocolates or a scented soy candle! 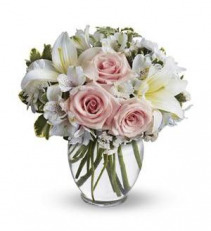 Roses and lily's in blush to ivory, an elegant presentation for any occasion. 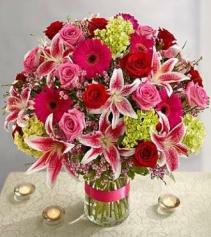 Browse HIGHLAND FLOWERS's Best Seller's for great ideas when you want to send flowers. See what's trending in the Vernon area. No matter what your occasion, these best selling flowers are perfect for any occasion. Whether you're sending flowers around the corner or across the country, HIGHLAND FLOWERS can help! 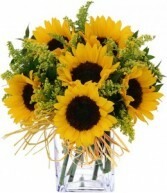 Substitiutions may be necessary for orders placed same day or next day delivery.